Condo, 2 Bedrooms, 2 Baths (Sleeps 4) - Zero Chance Of Snow! Peaceful two-bedroom, two-bathroom condo in the gated community at Villages at Grayhawk. Fully furnished second-floor unit with brand new furniture and accessories. Free Wi-Fi and high-speed internet (50 MBPS), new flatscreen television (with Netflix & YouTube TV). Ideal for snowbirds, vacation or corporate rental. New flooring throughout, fresh paint, new bathroom fixtures. There is an outdoor covered patio with a storage closet. In addition, this unit has its own single car garage and plenty of guest parking. The unit also has in-suite laundry. The quiet, gated complex is mostly mature residents. It has a landscaped, park-like setting with three luxurious pools, each with a hot tub and barbecue grills. There are also two work out facilities in the complex. There is plenty of excellent golfing near by. The TPC Scottsdale, which is a PGA Tour event, as well as the Estancia Club, which was rated as one of the Top 100 golf courses in America by Golf Digest. Troon North Golf Club, Topgolf Scottsdale at Riverwalk, Grayhawk Golf Club, Kierland Golf Club and the Phoenician Resort Courses are all nearby. If you're into hiking, there are plenty of good hikes, including Camelback Mountain and Pinnacle Peak Park, which are both a short drive away. Also, there are pristine tennis courts (no fee) at Grayhawk Neighborhood Park as well as basketball and volleyball courts. There are also two baseball diamonds. If you're into architecture, make sure you check out Taliesin West, which is a Frank Lloyd Wright classic. The main highlight in Scottsdale is the sunshine. The average snowfall per year is zero inches and there are on average 299 sunny days per year! I'm Dave and I come from a family of entrepreneurs. I love the city of Phoenix and the Scottsdale area, in particular. For those who love to bask in the sun (especially when it's cold in other places around the country), want access to good restaurants, fresh produce and activities like golf, hiking and lounging by the pool, you'll love Scottsdale. My favorite aspect is that wherever you drive, you have a scenic backdrop of the mountains, which is fantastic. This is a luxury property in an upscale neighborhood. The complex is a mature, quiet crowd. Most people spend their days relaxing by the pool, playing bridge, exercising and going for walks in the evening. It's close to a lot of golf courses and nice hikes. For entertainment, Kierland Commons is about 10 minutes away and the Scottsdale 101 Shopping Center is about a five minute drive away (movie theaters, Whole Foods, etc). There is air conditioning in the unit, controlled by a thermostat. There is heating in the unit, also controlled by a thermostat. There is a set of linens for the bed, so no need to worry about those. There is both a washing machine and a dryer in the pantry. You'll have you're own single car garage. If you require additional parking, you can park on your driveway in front of the garage or you have access to guest parking just steps away. You'll access to your own single-car garage. In addition, you can park another car in front of that if you like (you have your own driveway). The unit comes with free internet (high-speed) and free Wi-Fi. You'll have a modem/router inside the unit, so the free Wifi will be setup for you. I'll provide you with a set of towels to use. Fully furnished unit, brand new furniture (as of 2017). Side-by-side refrigerator with water filter and in-door ice maker. The stove has gas burners, which ideal for those who love to cook! The oven is attached to the stove. The microwave and fan can be found above the stove. There are sets of dishes, cutlery and cooking utensils. The kitchen is fully stocked with everything that you need. There is a stove with gas burners, an oven, microwave, refrigerator and pantry. Spacious dining area with a brand new dining room table. Tennis courts within five-minute drive. There are three pools in the complex only accessible to residents in the complex. There are three hot tubs (one next to each pool). Great location, clean unit and attentive owner. Good golf nearby, great hiking with the desert in bloom! This is a wonderful location in North Scottsdale. Many fine restaurants, stores and great golfing close by! Also easy access to other locations via Loop 101. This condo is very spacious...both bedrooms, baths and living spaces are large and comfortably furnished. 3 pool areas are lovely and well maintained, and good walking is right out the gate! The owner is very responsive to all requests and makes every effort to ensure his guests have a good time! We highly recommend this home to enjoy Phoenix and Scottsdale! The condo is lovely and in a great location. The complex is terrific. The owner checked in periodically to make sure we had everything we need. Can't wait to come back next year. We were very impressed with the condo, the location, and Dave, the property owner. We could walk to Starbucks and close-by parks and shopping! The property is very upscale, quiet, and safe. Dave was very attentive to any requests, and even brought over a sound bar for the TV, a NEST for the a/c controls, a Google Home device, and add'l supplies. We were very comfortable and the bed was perfect! The unit is very well maintained and is completely furnished and equipped. Highly recommended!! Dave was a great host and will stay at his place again. Check in was really easy as he coordinated with us throughout the entire process. The flooring is beautiful! The unit is spacious and clean, and looks better than the photos. King bed in the Master Bedroom is really comfortable. Great neighborhood, located in an upscale gated community. Quiet and peaceful complex with nice heated pools. And its closed to tons of golf courses, including the TPC Scottsdale, which is what I came for. My wife and I really enjoyed our month in the Greyhawk area. The condo was perfect for our use. The location is excellent to do pretty much anything we needed and wanted to do or see. Hopefully we will be back next year. 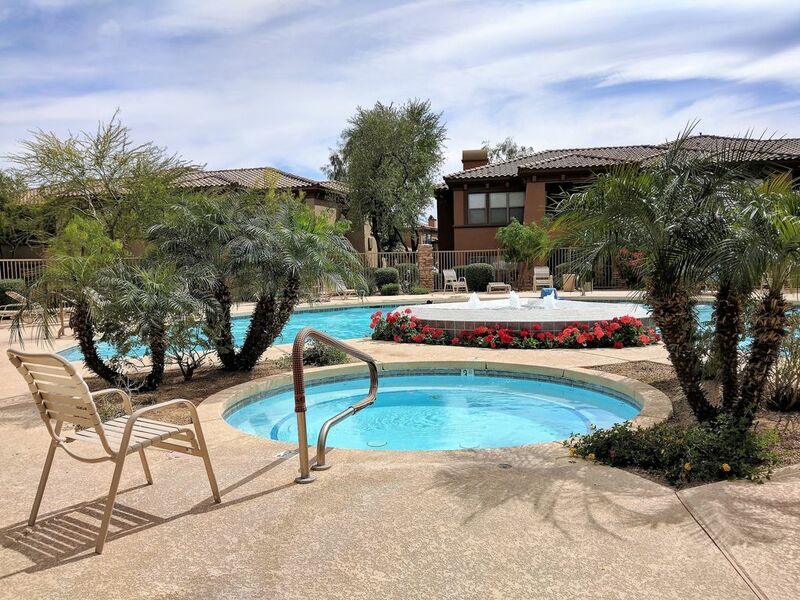 Villages at Grayhawk is in the ideal location because the gated community is very peaceful and quiet, but if you're looking for activity, there is plenty that is very close. Scottsdale Quarter and Kierland Commons are less than 10 minutes away driving and offer great shopping, dinning and nightlife. There are two movie theaters within about a 5-10 minute drive. There's plenty of grocery stores, bars and pubs. And if you're looking for adventure, there is fantastic hiking, biking and golf. You're in the center of it all.